African wild grapes is rated to be the best among all wild growing grapes in Africa. This has the best taste. Usually a woody climber, or liane, with rope-like stems reaching the tops of 20 m high trees and looping from one to the other, occasionally forming a small tree 3-7 m in height. The bark is greyish and young branchlets are densely covered with thick, rusty hairs at first, becoming hairless with age. The tendrils are also velvety. 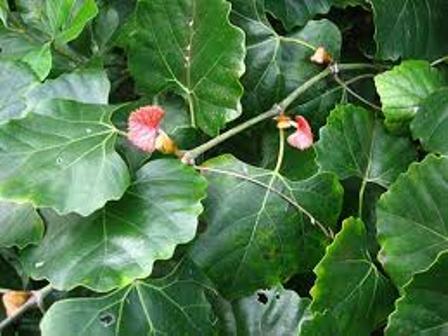 Leaves are simple and large, 90-200 x 70-160 mm, almost circular or wider than they are long, or kidney-shaped. The upper surface is deep green and hairless, whereas the under-surface is covered with soft, dense, rust-coloured hairs; occasionally these hairs are confined to the veins. The leaves are conspicuously 3-veined from the base. The margin is sometimes entire but is usually shallowly toothed and slightly wavy, or conspicuously 3-lobed but not deeply divided. The petiole is velvety and up to 6 mm long. The young growth and new leaves are conspicuously covered in the velvety hairs and are richly coloured in shades of copper and purple. The old leaves turn crimson before falling. Flowers are small, creamy green in colour and are clustered in dense heads on an approx. 20 mm long stalk. The buds are densely furry, covered with rust-coloured hairs. Flowering time is midsummer (Oct.-Jan.). Fruits look like grapes and grow in loose bunches; each one is an almost spherical, fleshy berry, up to 20 mm in diameter. 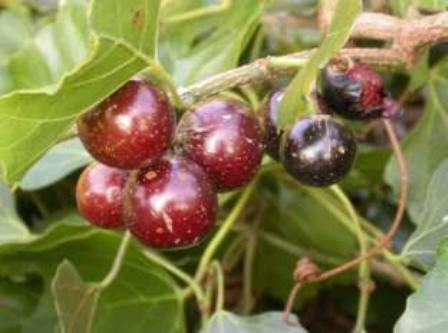 They start out green but become red and then deep purplish black when fully ripe at the beginning of winter (May to June). The fruits are pleasant-tasting but acidic with whitish flesh that is similar to that of the cultivated grape. Inside each fruit are 1-3 smooth, pear-shaped seeds, approx. 6 x 8 mm. The fruits are eaten. Local people, however, advise that these should be eaten in moderation as overeating may lead to diarrhea. The juicy, pulpy ripe fruits boiled with plenty of sugar (7 grapes to 30 g sugar) make a brilliantly coloured and delicious jam or jelly. A reasonable wine can also be made from the fruits, described as sour with a pleasant fragrance. The fruits are also used to make vinegar. The pliant branches are split and used as rope for tying down thatch and also in basket-making. The tuberous rootstock is poisonous and is used in traditional medicine The roots boiled in milk are given to calves to expel intestinal worms. They are also used during pregnancy to facilitate delivery. 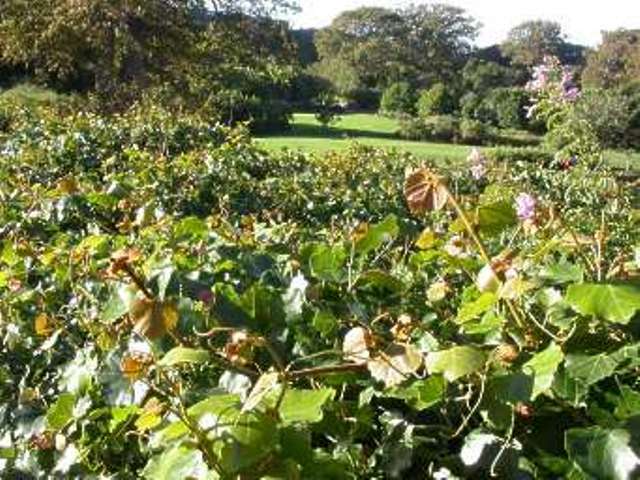 This wild grape is not cultivated for its fruits but is planted in gardens as an ornamental climber. African wild grape can be propagated by seed, sown in spring-summer, or by stem cuttings taken in spring-summer, or by layering done in spring-summer.